Variegated Snake Plant (Sansevieria trifasciata Laurentii) is a great indoor plant. This tall robust plant grows up to 3 to 4 feet tall with a tight clump of many vertically inclined dark green leaves with lighter gray-green, zig-zag, horizontal bands and broad, longitudinal, yellow stripes along the margins. 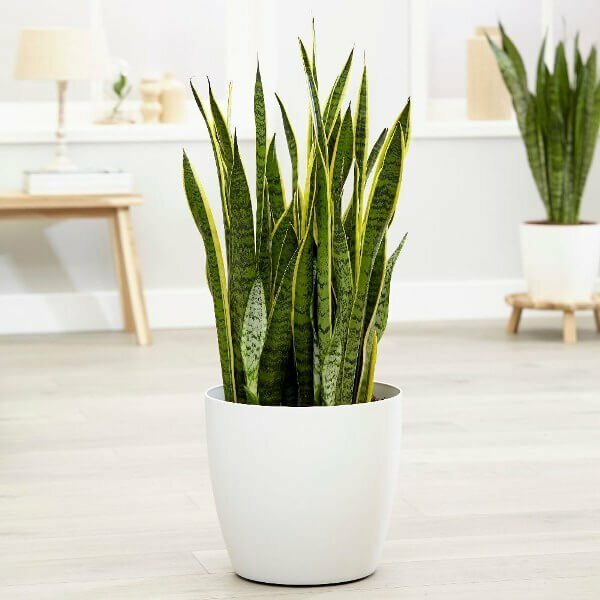 According to NASA’s Clean Air Study, the variegated Snake Plant filters indoor air pollution, particularly benzene, formaldehyde, trichloroethylene, xylene, and toluene. Variegated Snake Plant Plants are mildly toxic if eaten. Keep away from children and animals. Synonyms : Sansevieria laurentii, Sansevieria zeylanica var. laurentii, Sansevieria trifasciata var. laurentii. Common Names: Mother-in-law’s Tongue, Variegated Snake Plant, Devil’s Tongue, African Spear, Bow String Hemp, Bowstring Hemp, Snake Plant, Good Luck Plant, Goldband Sansevieria, Viper’s Bowstring Hemp, Magic Sword, Laurentii Snake Plant. It requires bright, filtered light and can stand plenty of direct sunlight but will adapt to low light conditions too. It thrives best in well-drained, sandy soil enriched with peaty compost. Water your plant regularly during the growing season and always keep the soil evenly moist but not soggy. Allow the topsoil to become slightly dry between each watering. During the winter months, reduce watering. It prefers an average to warm room temperatures 65 – 75 degrees Fahrenheit / 18 – 24 degrees Celsius. It will endure fluctuating temperatures, but not below 55 degrees Fahrenheit / 13 degrees Celsius. Fertilize monthly during the active growth periods in the spring and summer, with a liquid or water-soluble fertilizer. Try not to fertilize during the winter season. It can be easily propagated by dividing up overcrowded clumps of leaves. Separate clusters of leaves from rootstock with a sharp blade or knife when the leaves are six inches long. Most clusters will have some roots attached and can be planted directly in the normal potting mixture. Also can be propagated by leaf cuttings. Re-pot the plant during the spring season, only when plants get crowded and need dividing. There is no serious pest or disease problems. Watch for bugs, spiders, and mealybugs.